The latest news is that UKMSSB has uploaded Medical Officer (MO) Admit Card at www.ukmssb.org for the examination to be held very soon at various exam centres. The examination will be held for 712 posts of Medical Officer. Earlier the notification for recruitment of MO had released in September 2017. The online applications were invited from 06th September to 20th October 2017 at official website www.ukmssb.org. The final selection will be made through written test and interview processes. The admit card and interview letters will be uploaded for these two stages separately at www.ukmssb.org. Now selected candidates will join with appointment letter which will be issued to the selected candidates. Selected candidates are advised to bring the following documents at the time of joining. Now Final Selected candidate will have to get appointment letter which will be issued by UKPSC. The date of Joining and reporting venue is mentioned on the appointment letter. Candidate must bring original documents along with a photocopy set of original documents such as 10th, 12th, Graduation, MBBS Degree or others along with domicile and caste certificate. Candidate should bring two passport size photographs at the time of getting appointment letter of Clerk Posts. Candidates are advised to bring at leave two coloured photograph, 2-5 blank A4 size paper sheet at the time of getting appointment letter/joining to the station (for writing joining application). 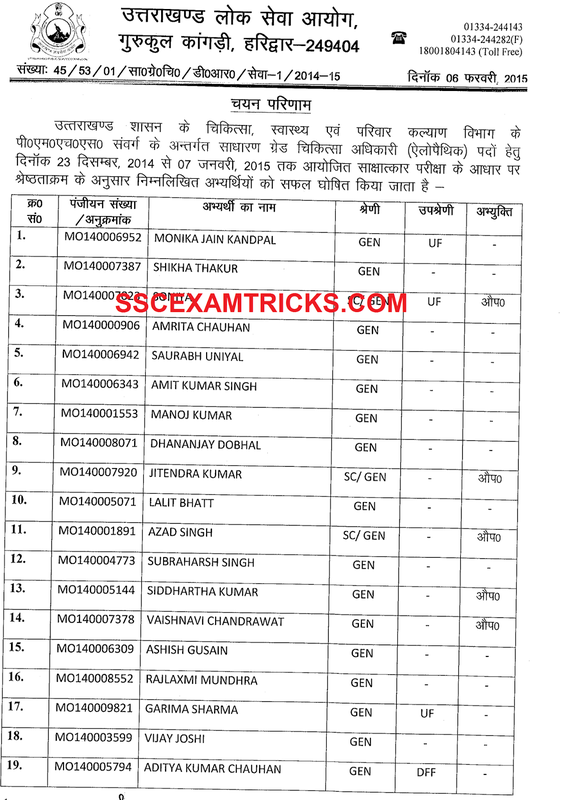 Uttrakhand Public Service Commission (UKPSC) has released the Final Result / list of finally selected candidates based on the performance in personal interview which was conducted from 23rd December 2014 to 07th January 2015 for 326 vacant posts of Medical Officers (General Grade) in Public Medical, Health and Family Welfare department (PMHS). The Final result is released on the merit list prepared on the performance in interview which was of 100 marks. The qualifying score for general candidates was 45 marks, for Other Backward classes it was 40 marks and for SC/ST the qualifying score was 35 marks. The Final cut off marks is also release on the official website for the final selection of the candidates. A huge number of candidates had appeared for the personal interview. The interview was conducted along with verification of documents which was required to bring at the time of interview by the short listed candidates called for personal interview. Those candidates who had appeared in the interview and waiting for their interview result can download their result from the direct link provided in the end of the posts. Click here to download List of Selected Candidates for the posts of MO in PMHS Department.